A very ancient city (it was founded way before the Roman age by the Euganean people) Vicenza is know especially today, with Treviso, as one of Italy's North-east financial capitals, as well as the centre for many industrial and craft activities (among which the best known by tradition is the gold craft). You will certainly be impressed by the city's industriousness and efficiency, but you cannot miss a very beautiful historical centre, and a surrounding area which, despite heavy industrialisation, still maintains very charming spots. As well as some remarkable buildings in gothic-Venetian style (the churches of S. Lorenzo and S. Corona, 13th century), heritage of the long dominance by the Venetian Republic, the works of Andrea Palladio, one of the highest architects of Italian Renaissance, give a special atmosphere to the historical centre. For the Teatro Olimpico, Palladio was inspired by the "old style" theatre model, following the re-discovery of Renaissance according to Vitruvio's studies; the staging for the opening show is the same as we can still see today. The Basilica Palladiana, true symbol of the city, is a monument unique in its kind, as Goethe said: "it is not possible to describe the impression made by the Basilica di Palladio...". The double order of white loggias exhibits its elegance and solemnity: the rising of its structures seems infinite, the game of light and shade is seductive. Here Palladio, chosen for just the re-building after a collapse, worked on a pre-existing structure; yet he was able to impress on the Basilica, and to the city, his indelible mark. The surrounding area is pinpointed by sumptuous Palladian villas, part of a greater country lordly residence complex called "Ville Venete". 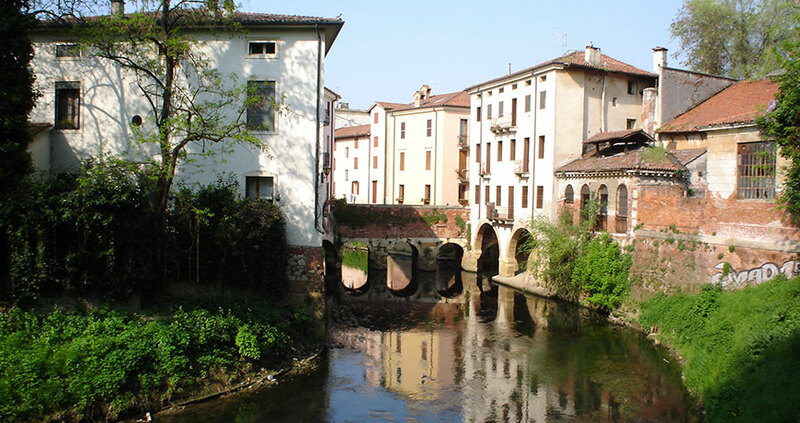 Among those in the province of Vicenza, La Rotonda stands out for its architectonic perfection. It was commissioned to Palladio in 1565 by Paolo Almerico, referrer of popes Pio IV and Pio V.
Vicenza is an important fair centre, and there are many interesting appointments throughout the year. The International gold exhibits, dedicated to operators in the business, are four: Vicenzaoro1(in January), Vicenzaoro2 (in June) Orogemma (in September), the International Clock Fair (in September). Exhibits for the public include Spaziocasa, the furniture fair, and Vicenza Numismatica, the most important event in Italy for coin lovers and collectors (in October).